CAL 2018 FIRST TEAM ALL-STAR FOOTBALL: Jack Ford, Liam Farrell, John Lee, Jaret Simpson, Cole Moretti, and Clayton Marengi. 2019 LHS FOOTBALL CAPTAINS: John Lee, Clayton Marengi, Michael Julian, and Anthony Floramo with Head Coach Pat Lamusta. 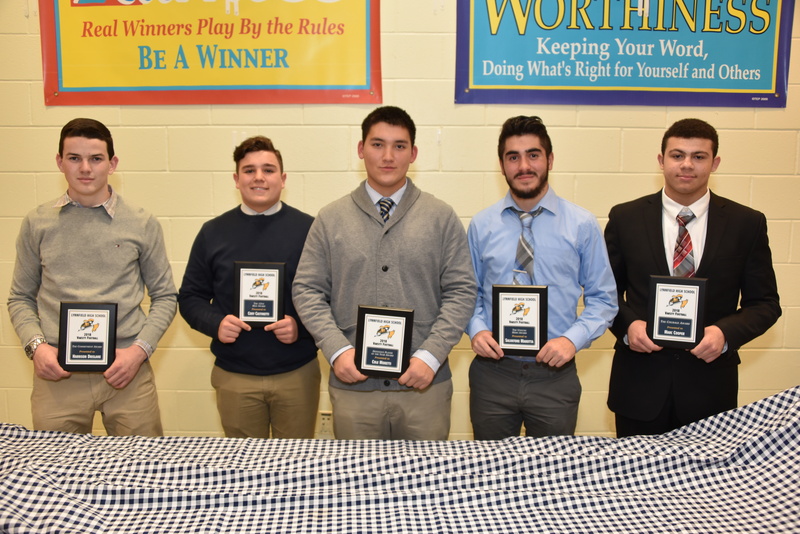 LHS 2018 Varsity Football The Commitment award winner Harrison Drislane, The 12th Man award winner Cory Castinetti, Defensive Player of the Year award winner Cole Moretti, Unsung Hero award winner Salvatore Marotta, and Courage Award winner Marc Cooper. LHS 2018 Varsity Football Game Balls: David Capachietti with the LHS vs Salem ball, Matthew Fiore with the LHS vs Manchester Essex ball, and Jack Ford with the LHS vs Wakefield ball. LHS FOOTBALL 2018 CAPTAINS BALL: Leo Quinn, Jaret Simpson, Hunter Allain, and Cole Moretti.